It was time to get serious about building the chicken coop. Either we built in time for the chicks, or the chicks would need it before we had time. Finding a place to put the chicken coop was our first obstacle. We have a great yard but not a whole lot of space to work with. We decided to go with a semi built storage shelf by our office nook where we kept our composters. Coming up with the plans was easy once we started jotting down our ideas. Keeping with the simple logic, we decided to build our coop in two parts. A good poultry house protects the birds from the elements (weather), predators, injury and theft. Poultry require a dry, draft-free house. This can be accomplished by building a relatively draft free house with windows and/or doors which can be opened for ventilation when necessary. It is also necessary to build the coop on high, well-drained areas. This prevents prolonged dampness and water saturation of the floor of the coop and outside runs. Allowing an adequate level of space per bird also helps keep the humidity level in the coop to a minimum. The first part would be the actual coop house, where we would keep the nests for our future eggs. This section we would put in an elevated area. The next part would be a chicken run. This is the area that the hens will be able to cruise around and play in the dirt. We started out by cleaning out the designated area, and building a frame to get an idea of what we would be working with. We wanted to keep as much as a natural element to the coop as we could, so we worked around existing branches and structures already available. Once we got the frame up, we started to add the chicken wire. We built the chicken run area large enough for us to stand in. This will help with cleaning out the area in the future. The wire mesh we are using has a 1" wholes. This is the recommended size for chickens. We also learned that it is much cheaper to by the wire mesh that they use for roofing. It is the same stuff that they sell for chickens. It is just marketed for a different use, and comes in a larger roll. The wire mesh we purchased is 20 gauge, 36" wide and 150′ long. We will most likely only use half of what we purchased, but can use the rest in the future around our garden. When building the actual coop house, we needed to make sure that the hen’s will have adequate space for movement and exercise as well as areas to nest and roost. It is recommended for egg laying hens to have 1.5 ft of space inside the coop, and 8ft of space in the run. We will also add perches for them to hang out on. With these chickens, we will provide 6 to 10 inches of perch space per bird. We will also provide them a nest. You should always provide at least one nest for every 4-5 females in the flock. This is what the view looks like from inside the coop house, looking out to the run. Slowly but surely it all starts to come together.We still need to add a pen door, as well as make sure everything is tight and secure from predators. Once we are done it will be important to remove any loose or ragged wire, nails, or other sharp-edged objects from the coop. We will also eliminate all areas other than perches where the birds could perch more than 4 feet above the floor. These extra measures could eliminate any injury to our birds and may prevent damage to the coop, as well. Once the coop house is done, we will retrieve our eggs from this door. We decided to leave the existing wood structure for the back wall to their house. This way they can enjoy some old old ivy vines for natural decor. We built a raised floor in the coop area to assist in the ventilation as well as the cleaning and the collection of their waist for composting. The floor is built with the 1" chicken mesh, raised about 4 inches off of the floor. We will place a large tray down below for easy collection of their waist before they move in. This is a view from inside the chicken run area, up to the coop house. We are about 90% percent done with the coop. We should be finished with it by next week, giving us a few days of tweaking it out before the chicks will be ready to move in. The chicken coop is replacing the dog house in many suburban homes for a good reason. Chickens are a local source of protein a natural pest controller, and make a great fertilizer for your garden. Find out about poultry care, different breeds, chicken coops designs and more. The following images, videos and diagrams are of different home scale aquaponics units. Some of these units perform better than others, but each one is unique and a reference for those attempting to figure out what to build. Another type of aquaponic system that is used both commercially and on home scale is the constant flow aquaponic system. There are both advantages and disadvantages to using this type of system over a traditional ebb & flow system, the choice is left up to the farmer. Some farmers swear by the constant flow system as it requires less maintenance, however this is not always the truth, as it does require that you supply ample amount of oxygen to the tank for both the fish and vegetables. 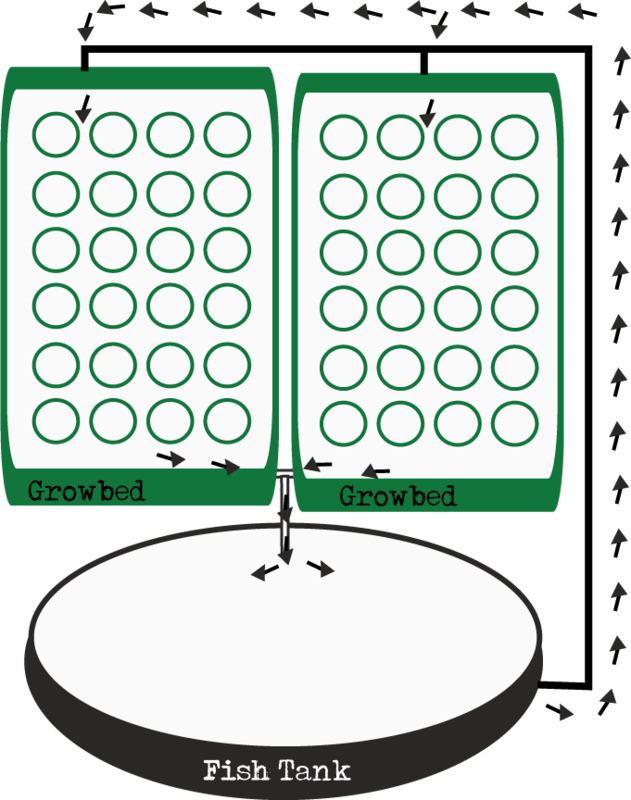 The graphic below shows a single grow bed designed for using without a grow medium. These beds are flooded to an approximate depth of 12 inches and flowing continuously from and to the fish tank. The plants are secured in a floating platform with the roots extending directly into the water. With this system, you need to make sure the water is properly aerated to give the plants sufficient oxygen to the roots. The following Information was provided via DIY Aquaponics. These guys are great, I would totally reccomend that you check out thier website for more information. “Building an air flow aeration system is a little labor intensive to build. I don’t mean difficult though, just time consuming, but it can’t be beat for creating bubbles over a wide area and oxygenating the water. Basically it is very simple. For this system you can use an air pump or large commercial oil-less air compressor (which ever you use, it must to be oil-less). It is recommended that the air be pumped through a high pressure copper tubing supply line. A regulator outlet valve can be attached and used to provide a lower air pressure to a 2 inch PVC manifold leading to the inflow end of the fish tank. From the manifold, a piece of 1 inch PVC tubing is extended about 10 inches out over the edge of the fish tank and elbowed at a 90° angle toward the bottom of the tank. Another 90° elbow is installed at the end and another piece of 1 inch PVC is then run across the bottom of the tank. It sits about 2 inches from the bottom of the tank and running from one side of the inflow end of the tank to the other and a capped is installed on the end. That portion of the tube is where the actual intensive labor comes in. Before it is installed, naturally, to create this section, draw straight lines at 1/4 inch intervals around the 1 inch PVC from one end to the other; then mark them at 1/4 inch increments from one end to the other and draw a line around the tubing at each mark. Using a 1/32 inch drill bit, drill tiny pin-holes where each of the lines intersects. It is permissible to even drilled holes in the end cap just for good measure. I mean why not, it was there! This is the difficult part as the drill bit is hardly larger than a needle. A larger pin hole can be created using a 1/8 inch bit if desired, but the smaller holes create a much finer stream. Suffice it to say, it is possible you will break a number of bits before you finished. However, the results are well worth the effort. A study stream of foam like bubbles can be created which can actually cause the water to boil up at least 1 to 1 ½ inches above the water level of the tank all across the end of the tank. Drip systems are commonly used in gardening around the world. The concept is simply provide the needed amount of water directly to the plants roots. The drip system was able to revive gardening and farming in areas where wahter is scarce because of its controlled water wise system. Aquaponic farmers have adabted the drip system for a number of reasons, however controlling the exact flow of water and distributing it egally through out a grow bed has to be one of the elading proirities of using such a system. The diagram above shows a simplified verson of a drip system used in aquaponic farming. The black spots represent where the plants are places. The nutirent rich fish water is pumped from the fish tanks to the manifolds sititng at the top of the grow bed. Holes are then drilled into the manifolds and small tubing spickets are inserted into these holes and secured with glue into place. Drip tubes cut into the desired lengths are then pushed onto the spickets and placed in the grow medium next to each plant. The system pumps are operated by a timer which turns them on and off at your desired period of time, pumping water to the plants and then allowing the cleaned water to return to the fish tank via the gravity feed system.